Scottish Independence Day? Here's a Date For Your Diary! So you thought that Homecoming Scotland was politicised in 2009 did you? Well I'd guess that you ain't seen nothing yet! As the Celtic heads of their individual parliaments gather today in Edinburgh and the Scottish Tourism Forum make plans for their first post election gathering in Crieff tomorrow it seemed like a good time to reflect on what's ahead following the landslide election result. We all know a referendum is coming and we all will look at that concept in varying shades that's for sure but there is little doubting in our opinion that it will have a significant (positive) impact on the business opportunities for hospitality related businesses in the run up to it. But therein lies the sixty four million dollar/pound/euro question. When will it actually take place and how do we allow for these opportunities? Well Mr Salmond, has already made it quite clear that the referendum will happen but not until the second half of the parliament. Both he and his opponents understand fully why this is not going to be a rush job - well we think they must. It6's not to do per se that it needs to be in the second half of the parliament. Not all to do with the work needed to be done to set the ground rules or the platform for a positive vote and surely a lot more to do with maximising the potential for a yes through the correct timing of the vote. Timing is they say everything. Perception they also say is everything. Take your pick. But choose the time when perception of our strengths and potential as a country are at their highest and you will be able to inevitably swing more voters towards the necessary positive. So what exactly does this have to do with tourism and hospitality and our plans for investing in our business, our area, our regions and our infrastructure? Well 2014 is in the second half of this parliament's life. It has already been designated the second year of Homecoming. Glasgow hosts the Commonwealth Games. The Ryder Cup is at Gleneagles. It is the seven hundredth anniversary of Bannockburn. It will also be the year of an Independence referendum! Do you really think that a referendum was intended for any other time? I am pretty certain that that Salmond et al cannot believe that all the scenario planning has come to this. Salmond the supreme strategist must have sat down with a big list of what ifs and couldn't possibly have hoped for such an opportunity as 2014 to secure the yes vote that would have seemed so impossible only a few years ago. The political pieces have fallen into line with a series of events that will see Scotland having the highest profile as a small country for many decades and it would be impossible to image than he won't leverage the opportunity. Scotland will be the centre of attention in a sporting and cultural sense for sure and will provide the SNP ministers with photo opportunity after photo opportunity to maximise the national pride and sense of optimism that is undoubtedly required to garner a yes vote to such a big question. You can almost see him parading around Hampden in an open top bus - well no you can't because therein lies another lesson learned from the past. Remember the last referendum? It took place in the wake of the disaster that was Argentina; the euphoria that lead up to Ally's Tartan Army marching band had not only been dissipated but many political commentators argue that the hangover of that world cup debacle was instrumental in the defeat in the March referendum which followed. Scottish supporters that they were going to win. Reflecting on this in relation to the 1979 referendum, Harvie suggests that Matters political might have been a lot different had they won, and that the 'we were rubbish hangover' certainly contributed to the 1 March outcome. (Harvie 1994, p.197). " Change the title of the paper above to Sport, Culture, Tourism, Nationalism and the Scottish Parliament and you can see that there has quite possibly never been and never will be a better chance, a more fortuitous set of circumstances perhaps, of a Yes vote in Scottish history. It also leads you to think that sport and culture will play a major part indeed the critical role, not just in determining the year but the time of the year that will offer the point of highest returns for determining Salmond's independence vote date. Let's look at the calendar. January 2014 - Burns Day/Month - The bard will not be missed out in the evangelical song of self determination even this particular year doesn't celebrate anything in particular. The new museum has opened in Ayrshire and will play a political role in January. Expect some major Burns promotion in the south west of Scotland. 24th June - the seven hundredth anniversary of Bannockburn. It will not be played as an overt anti English card but then you just need to make sure that you celebrate our history and our heritage, fly some standards and let the emotion flow. It will be utilised for sure! 13th of June - World Cup Opening Ceremony in Brazil with the final month one month later. A reason why the referendum would not take place in this particular five week period - and also a very good reason why it wouldn't take place afterwards. If we're there we could be a disaster and the Argentina example will have been learned by Salmond. 23rd of July - Scotland hosts the Commonwealth Games and the months ahead will see the SNP talking up Glasgow as if an independence result depended on it! September 2014 - The Ryder Cup rolls in. The political potential for this event over the coming three years is immense. The role of Scotland in the world of golf will be promoted as it never has been before and the industry should be ready to leap on the money spent ahead of it as it will disappear just as quickly after the last putt has been sunk. So when can we expect a referendum? Well not after the World Cup - the Argentina Effect will not have gone unnoted for Salmond. It will not take place after the Brazil World Cup, it will therefore be a Thursday before the 13th of June. It also follows that the maximisation of the feeling of pride ahead of both The Commonwealth Games and The Ryder Cup would also be beneficial to the vote and therefore the chance of things going wrong (ie factors outwith of Salmond's control) should be avoided. He can manipulate if not control the advanced publicity and PR but hands over event management and critically results into the hands of others. Salmond the Strategist will not take such a risk with his defining moment. So, that narrows it down. March to June? Thirteen weeks to choose from and the optimum date to be selected from thirteen Thursdays in 2014. Which one of the thirteen will be the lucky one? Winter problems and gloomy weather? Avoid as far as possible. Bank Holidays? Too many in May makes it another problem with the Spring bank holiday on the 26th of the month. Easter falls on the weekend of 18th - 21st of April writing the latter part of that month out as well. So let's narrow it down to the following dates: April 10th, May 1st, 15th or 22nd or the 5th of June? Best bet? Depends on whether we qualify for that pesky World Cup football thingy in Brazil! If we do I'd go for the 5th of June. One week before the World Cup may be a big risk and one that may be too big for him to take but if we have qualified the kick back will be potentially massive as we head out to The Copacabana and the World Stage; if we don't then they will know by the October of the previous year and that may be what could influence the date to be the 1st of May. June is also the month of Bannockburn and that background emotional attraction of being independent by the 700th anniversary of that victory could influence. I know even as I reread (and I rarely ever reread anything!) I've never written as big a piece of contrived fiction since my English O Level analyse of "Cynddylan on a Tractor" but to think that Alex Salmond has not already been through this is underestimating the man's intellectual prowess. So I'm phoning up Paddy Power looking for a fiver on the nose for the 5th of June followed by a placing on May 2014. I'd also safely bet that it's going to be a good time to be in the tourism and hospitality business! The Scottish Universities Industry Innovation Network for Food and Drink is a partnership of 17 Scottish universities which will work to meet the research and innovation needs of Scottish food and drink companies. Working in partnership with businesses and their supporting trade sectors, academics from multiple disciplines will work to deliver a range of knowledge exchange projects in areas including food science, supply chain development, waste management, packaging design and marketing for the benefit of industry. Led by the University of Aberdeen, the University of Abertay Dundee and Heriot-Watt University together with Interface - The knowledge connection agency for business, the Network is specifically designed to meet the needs of the Scottish food and drink industry expressed by its members during a consultation process. SFC will invest £2.64 million over five years to a total funding package of £10.58 million of cash and in-kind investment. The 17 partner universities will contribute £3.1 million of in-kind support, with trade associations such as Scotland Food and Drink and participating companies also providing £4.84 million of cash and in-kind support. Scotland's food and drink industry is a key sector of Scotland's economy, generating over £9.5 billion per year, and employing over 360,000 people. The Scottish Government identified the food and drink industry as one of six key industrial sectors drivers for future economic growth in its Economic Strategy. Mark Batho, Chief Executive of the Scottish Funding Council, said: "The Funding Council is delighted to invest in this unique network, which will lead to great benefits for Scotland's food and drink industry and increased demand for the excellent research of Scotland's universities. This is the first time such a multi-disciplinary collaboration of researchers, from almost every Scottish university, have come together to focus on a key sector." "Innovation is a fundamental part of any successful industry. The food and drink sector is worth billions of pounds to our economy and has a major contribution to play in securing Scotland's economic recovery. "The Scottish Government wants to see the sector grow to £12.5 billion by 2017, and I am wholly committed to heralding Scotland's larder both at home and abroad through our Recipe for Success vision. This £2.64 million package will bring together the very best talent and research from academia and business, helping to strengthen and expand every aspect of this crucial industry. "Linking up with our internationally renowned universities can only increase the sector's global competitiveness and provide a valued contribution to our aim of making Scotland a land of food and drink." Bookassist's Senior Social Media Strategist Paul Ferry outlines a winning formula for guaranteed success in generating revenue through Facebook. Bookassist Apps For Facebook were successfully launched at the end of April 2011. With hundreds of hotels worldwide already using the Bookassist Apps on their Facebook pages, it is now time to see how hotels can use the apps to their full potential and earn extra revenue using the power of Facebook. At Bookassist, we have put together some tips to successfully generate a new revenue stream for your hotel on Facebook using the Bookassist Apps For Facebook. The following tips are based on research and tracking of revenue-generating promotional pieces on Facebook using only the hotel’s Facebook fan base and the Bookassist Apps For Facebook. 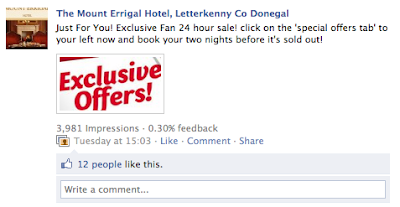 Remember that your hotel’s fans on Facebook receive your hotel’s posts in their news feed on their own Facebook page. 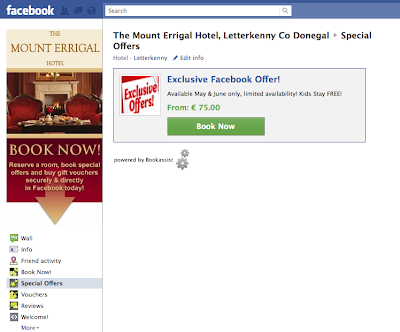 They don’t need to be on your hotel’s Facebook page to begin interacting with you. The news feed is where your hotel can constantly get in front of your fans. The key to success is that your hotel needs to post their promotional content as frequently as possibly (but not overkill) to ensure visibility to all of their Facebook fan base. Without telling your hotel’s fans about the latest promotions regularly and at the right times, more than likely they will not interact or not even see the promotional text in their feed. Remember this is free - there are no advertising costs, there are no pay per click costs, and it is targeted directly at people who have already expressed a direct interest in your product. This is an opportunity not to be missed. From our research, posting between the hours of 7pm and 10pm will get a higher interaction from your hotel’s fans. Posting throughout the day will receive a substantial amount of views from your hotel’s fans but their interaction isn't as high as later in the day. Research has also shown that weekends can be a good for higher post interaction, but the amount of views will be substantially lower compared to weekdays. Posts should always include links to wherever your hotel’s fans can buy the special offer or view details of the promotion. 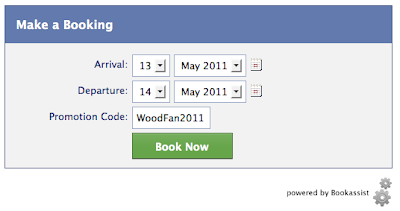 This includes linking fans directly to the Bookassist Apps for Facebook tabs on your hotel’s Facebook fan page. Adding simple and attractive special offer or promotion related images, or videos, will also improve your fans’ interaction. Another powerful and simple way to raise your fans’ interaction when they visit your hotel’s fan page is to design a descriptive Facebook profile image that features a strong call to action. Your hotel should design their Facebook profile image to clearly indicate where the Bookassist Apps for Facebook buttons are located. Figure 1 shows two examples of simple but effective Facebook profile image redesigns that encourage interaction. Sending an ezine, newsletter or mail shot to your hotel’s contacts referring to the your Facebook page’s latest additions (i.e. the Bookassist Apps for Facebook tabs) can also generate awareness of the apps tabs and the new buying facilities on your hotel’s Facebook fan page. It may not convert now but it plants the seed for future conversion. 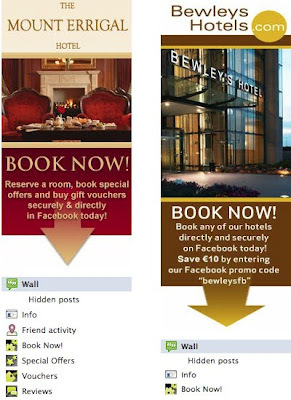 Bookassist developed a suite of apps that hotels can use to gain revenue on Facebook. We have detailed how each app can by utilised to its best ability and functionality. The Bookassist Special Offers App has shown itself to be the most powerful app of the suite to entice your hotel’s fans to buy. This app has the ability to either show all your hotel’s special offers, a few of your hotel’s special offers, or just show one special offer at a time. This can be extremely powerful if you are promoting the hotel’s latest special offers, trying to fill low occupancy dates with a special offer, or having a special offer sale. For help with setting up your Bookassist Special Offers, simply contact your Bookassist account manager. The Bookassist Book Now App allows fans to make reservations just like on your hotel’s website. This app should be promoted by you as a new facility to make a direct reservation. As mentioned previously, simply designing a new Facebook profile image for your hotel can be very affective way to make your hotel’s fans aware of the Bookassist Book Now App. The app can also be used in conjunction with Bookassist Promo Codes that can be entered in the check availability box to provide your hotel’s fans with discounted rates or special offers. We can configure the hotel’s promo code to be automatically displayed to your hotel’s fans in the check availability box, if the hotel wishes. Another valuable attribute to the Bookassist Book Now app and Bookassist Special Offers app is that only people who “Like” your hotel’s fan page will see your hotel’s promo code or special offers. If they do not “Like” the page they will be greeted with messages encouraging them to “Like” the page before they can avail of offers. The Bookassist Vouchers App can be used to sell and promote your online vouchers. This app can be particularly powerful to promote your hotel’s vouchers around peak voucher sales times, for example promoting online vouchers at Christmas time. Promote the new voucher buying facility by simply adding a link to the Bookassist Vouchers App to your posts. From our research, there are a few specific actions that contribute to converting your hotel’s fans from lookers to bookers. Actions such as constant promotion of the Bookassist Apps For Facebook in your hotel’s posts and redesigning your hotel’s profile image to indicate the location of the app buttons certainly work. But these are just steps to make your hotel’s fans aware of the apps. The next step is to convert the Facebook fans from lookers to bookers. Our suggestion to achieve this goal is simple. Provide your hotel’s fans with the feeling of exclusivity. Providing them with an attractive special offer or promotion will best achieve the end goal of a booking. The special offer could be a simple reduction on a B&B rate by entering the promo code or an exclusive Facebook fan special offer. From research, our next suggestion for an effective way to successfully convert your hotel’s fans from lookers to bookers is to put a time limit on your exclusive offering, for example a twenty-four hour room sale or an offer with an expiration date fast approaching. As we have seen from the phenomenal success of daily discount sites, creating a sense of urgency certainly works and by using the Bookassist Apps for Facebook you can effectively create your hotel’s own mini discount site. You might not be reaching the same large audience as the daily discount sites, but neither is your hotel paying the large commissions charged by the daily discount sites nor suffering the significant rate reductions you must provide to have the opportunity to appear on those sites. Finally, if you have not already installed the Bookassist Apps for Facebook and you use the Bookassist booking engine on your hotel’s website, you can install them today for free by visiting our Facebook page at facebook.com/bookassist and navigating to the “Bookassist Apps” tab for instructions or visit the Bookassist Apps For Facebook product page on our website. If you have any additional questions please contact your Bookassist account manager. Over a year ago, Galloway Forest Park was awarded the accolade of becoming one of the 5 Dark Sky Parks in the world. With a large proportion of Galloway Forest Park located in Ayrshire, Steve Owens, Dark Sky Development Officer, will share information and opportunities for Ayrshire businesses in fulfilling some of the requirements of stargazing tourists. The night sky is free - and you can sell it and you can find out more at a Buffet and networking evening at the award winning Loudoun Hill Visitor Centre. The event is being hosted by Ayrshire Chamber of Commerce in association with Lanarkshire Chamber. 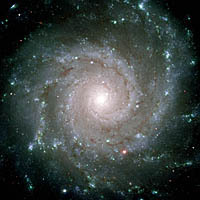 on the17th May 2011 from 5pm until 7pm at Loudoun Hill Visitor Centre with key speaker being Steve Owens who is the Dark Sky Development Officer, Galloway Forest Dark Sky Park. The cost is only £6.00 (incl.VAT) and includes a buffet - book online here.